Themed “Pathways to Mature Services”, the curtains come down on the fourth SERVIR Annual global exchange (SAGE) 2018. The fourth SERVIR Annual Global Exchange (SAGE) brought together over 120 team members from across the SERVIR network to Lisbon, Portugal from November 12-16, 2018. The biggest since its inception, the exchange drew participants from SERVIR hubs in Kenya, Niger, Nepal and Thailand; the SERVIR Science Coordination Office (SCO) in Huntsville, Alabama; NASA and USAID Headquarters in Washington, D.C.; USAID Missions; SERVIR Support Team; and SERVIR Applied Sciences Team (AST) members from institutions across the United States and selected partners for each hub. This year's convened scientific and technical experts for an intensive five-day program designed to foster scientific and programming innovation, build the capacity of the network, and refresh strategic approaches to delivering services. SAGE 2018 will enhance SERVIR’s effectiveness in helping partner countries apply Earth observation information to development challenges. Building on prior exchanges and significant network-wide investment in the service planning approach, this year’s SAGE focused on implementation and learning from SERVIR’s mature services, that is, those making a development impact. SAGE 2018 interrogated the concept of a mature service through exchange on: effective technical and programmatic approaches to developing and implementing a service fully and the foundation that mature services create for sustainability and scalability. Two SERVIR-Eastern and Southern Africa Staff Lillian Wangui and Kenneth Kasera got Awards for the best Poster Presentation and SERVIR Excellence Awards respectively. In some respects, SAGE 2018 topics were similar to previous SAGEs with extensive dialogue on service planning, partnerships and sustainability – but the emphasis shifted to delivery, uptake and impact. To ground the discussions, SAGE 2018 drew on use cases to illustrate experience-to-date and demonstrated impact. SAGE 2018 aimed at: expanding SERVIR’s ability to deliver effective services, drawing on the full range of network and partner capacities; learning from examples of good service implementation practice and exploring the multidimensional aspects of mature service delivery; uncovering synergies and sparking new ideas for collaboration across Hubs and with other partners; and advancing practical approaches to capacity building and sustainability. Attendees from within the network included: USAID (Washington and missions); NASA Applied Sciences Program, Science Coordination Office (SCO) and Applied Science Team (AST); Hub chiefs of party and science leads and technical leads working on user engagement, communications, knowledge management, capacity development and monitoring, evaluation and learning (MEL); and Support Team. The representation mirrorored the breadth of scientific and development expertise required to deliver effective services. During SAGE2018, SERVIR West Africa launched their website. A unique feature of SAGE 2018 was the participation of a small group of development/humanitarian partners together with additional USAID bureau/sector experts. 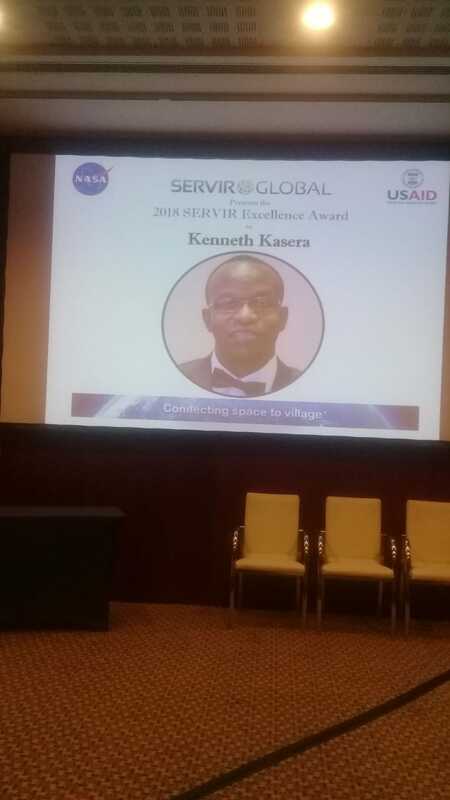 They represented existing SERVIR partnerships as well as those with strong potential for collaboration. Their participation was intended to deepen their awareness of SERVIR, deepen SERVIR’s understanding of their needs and challenges, and creating opportunities for synergy, mutual learning and other benefits. Partners were invited to join Days 2, 3 and 4.